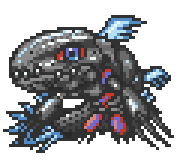 An ancient fish Digimon that possesses gigantic claws and a hard outer skin. 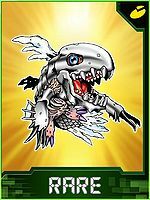 When the Computer Network was being repaired after being disrupted by a malicious hacker, this Digimon was discovered in the Net Ocean, and as its body structure is extremely primitive, it has fins that have developed like hands and feet. 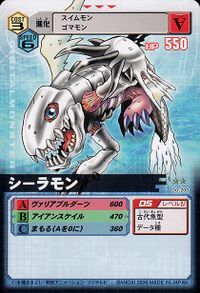 Based on this fact, it is conjectured that primeval Digimon that originated in the Net Ocean experienced many evolutions and took on terrestrial forms, and increased their numbers into various strains. Its Special Move is falling upon the opponent with its gigantic claws (Variable Darts). 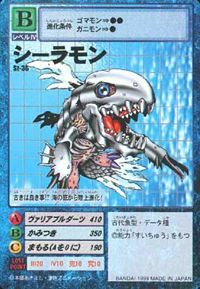 An ancient fish Digimon that possesses a hard outer skin and fins that have developed like hands and feet. Its Special Move is Variable Darts. | Coela is short for Coelacanth (「シーラカンス」 Shīrakansu), a type of ancient fish once thought to be extinct. 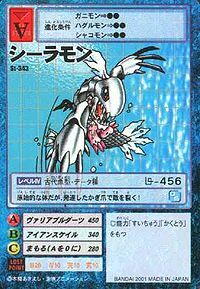 ヴァリアブルダーツ Variaburu Dātsu Variable Darts/Fossil Bite Slices the opponent with its claws, or throws blades of energy or knives of water. Fires a spear of water. ウォーターブリット Wōtā Buritto Water Brick Spits balls of water at high speeds. Shoots tiny scales from its body at the enemy. Kamitsuki  Bite かみつき N/A Ancient Bite Bites at the enemy with powerful jaws. 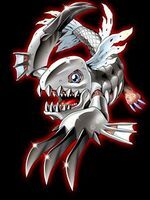 Coelamon is the evolved from of Ganimon, as well as the partner of Dingo, one of the Australian Chosen Children. 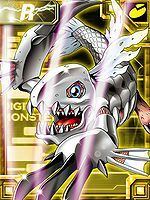 He assisted Zudomon and Submarimon in defeating a Gesomon, Shellmon, Ebidramon, Anomalocarimon and a Raremon who had gathered at The Great Barrier Reef. He then proceeded to destroy the last Dark Tower with his Variable Darts attack. In "Shoutmon, Roar! 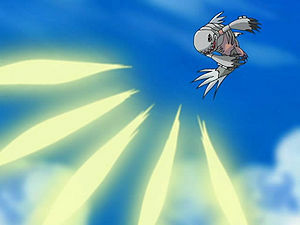 ", Coelamon was used as an enemy spy inside the Village of Smiles. Coelamon planned to "annihilate" Taiki and his friends, however Dorulumon killed him before he had the chance. 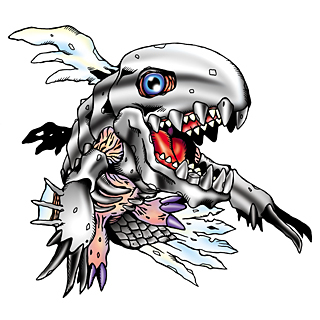 Coelamon appears as an obtainable Adult-level Data type Digimon in Digimon World. After you talk to Tunomon and Yuramon, they will mention about a special Digimon that swims around when its afternoon or evening in the beach, which its actually the Coela Point when the clock is pointing to the red area. 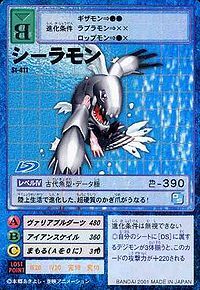 Once you reach to the Coela Point, you can see a shadow swimming in the sea, and if you approach to it, a Coelamon will appear and will assist you once you tell it that the Digi Bridge is broken. Coelamon calls out for its friends and help you travel to the Tropical Jungle. After you get there, go to the west and you'll see that the Digi Bridge has been repaired and will be able to take you back to the Village of Beginnings. Go back to the Coela Point, this time at any time to meet Coelamon again and talk to it, revealing that he wants join the city, where he sets up a small shop stand, selling some useful items. Once you recruit Betamon, it will assist Coelamon in its job, providing more stuff. After either Unimon, Monochromon, Patamon or Piyomon has been recruited along with Centalmon, Coelamon will quit its Shop business and hang around in the Centar Clinic. Bonus Conditions: Battle less than 5 times and have at least 35 different techniques mastered. Coelamon's Digivolution item is the Hard Scale which lets any Child Digimon evolve into Coelamon. 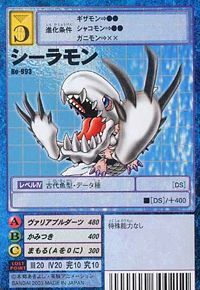 Alternatively both Shellmon and Whamon can Slide Evolve into Coelamon when the Digimon is at least 15 days old, though there is a 30% chance of happening. Coelamon spouts water, then impales the enemy with sharp darts coming from its nails. Coelamon evolves from Ganimon (0-2 DP) and evolves into Mega Seadramon (0+ DP). Evolves from Palmon. Can evolve to Megadramon. Evolves from Gomamon or Ganimon. 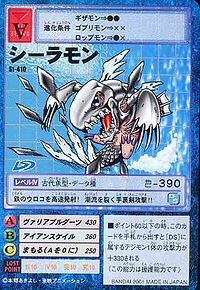 Can evolve to Mega Seadramon or be Jogressed with a compatible Digimon to evolve into Whamon, Anomalocarimon or Dagomon. Evolves from Liollmon or Otamamon. Can evolve to Chimairamon, Dagomon, or Metal Greymon X-Antibody. Can also Jogress with Blade Kuwagamon to evolve into Metallife Kuwagamon. Evolves from Pico Devimon or Ganimon. Older is better!? It left the ocean floor and evolved on land! It has a primeval body, but slices enemies with its highly developed claws! It fires its iron scales at high speed! Its shuriken attack slices through the tides!! Its super-hard claws roar out, having evolved for life on land!